Joyce Garline Clark Kirk, resident of Paducah, passed away on August 25, 2018 at the age of 82. 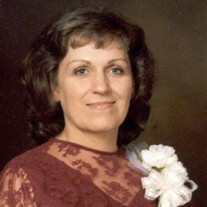 Born on March 31, 1936, she lived for her family, especially her children and her grandchildren. She had a beautiful smile and compassionate heart. She saw beauty in the simplest of things, admiring and smiling at the beauty of flowers, dolls, decorated cakes, colorful clothes, pictures of her family and especially another person’s smile or caring face. She was predeceased by: father: James Clark; mother: Kathleen Gordon Clark, brother: James Clark. Funeral services will be held at 1:00 pm on Tuesday, August 28, 2018 at Hughes Funeral Home with Rev. Jamie Coomer officiating. Entombment will follow at Woodlawn Memorial Gardens in Paducah. The visitation will be held on Tuesday August 28, 2018 at 11 am at the funeral home. Memorial donations may be made to: Alzheimer’s Association, Kaden Tower, 6100 Dutchmans Lane Ste 401, Louisville, KY 40205-3284, or St. Judes Children’s Research Hospital, PO Box 1000 Dept. 142, Memphis, TN 38101-9908 or the charity of the donor’s choice. You may leave a message of sympathy or light a memorial candle online at www.hughesfuneral.com.